It's such a delightfully sunny day here in ﻿Big D, and this beautiful weather has put me in the mood for some beautiful clothing. 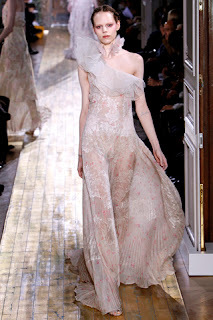 That's why I thought today would be the perfect day to highlight one of my favorite couture shows from last week. The Valentino show was full of light, frothy confections that filled me with joy! The layers of lace and tulle, in the wrong hands, certainly could have gone too princess-y. But, designers Maria Grazia Chiuri and Pier Paolo Piccioli created elegantly slim proportions and used feather-weight fabrics to perfection. Could we see some of these enchanting gowns at the Oscars? I certainly would not be surprised! Cheers to glamour, beauty and the perfect gown!